The use cases below illustrate the access levels of each actor. Like any website, visitors view one platform while administrators view a different platform. Additionally, the employees, other than admin staff, have yet another platform in which they view to complete their daily functions. 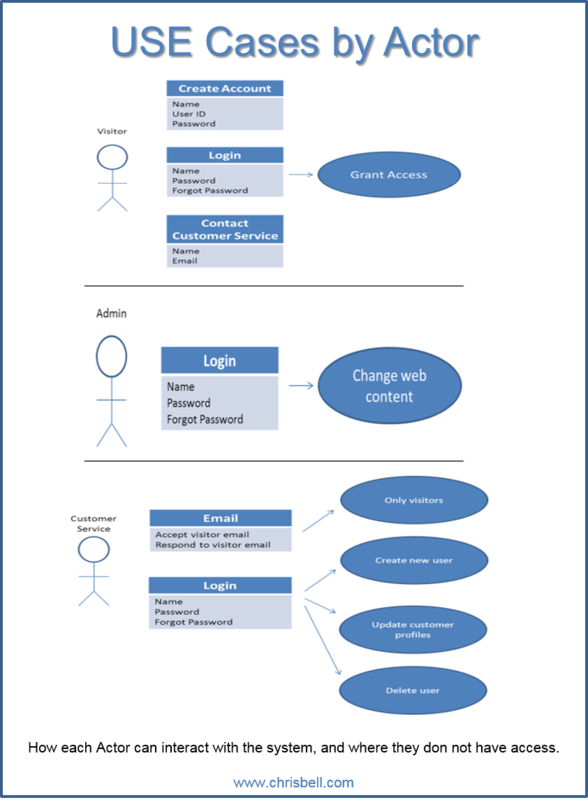 Though much more complicated than it seems, the illustrations below show who has access to certain pieces of the entire system. Warehouse staff, accounting departments, sales and management all have access to different amounts of the shared database, while personal information is encrypted. The programmers will translate the diagrams into code, then they build little forms for us to input specific information. Sales enters orders, warehouse employees ship the product and enter it into the system, and accounts send the invoice. Meanwhile, automatic replies and confirmations are being sent. Courlouris, G. & Dollimore, J. & Kindber, T. & Blair, G. (2012) Distributed Systems: Concepts and Design. Fifth Edition. Published by Pearson.